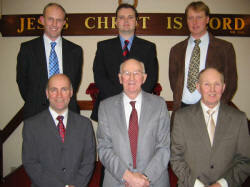 (back row) Adrian Whitten - Children’s Meeting, William Cromie - Sunday School and Michael Millar - Holiday Bible Week. 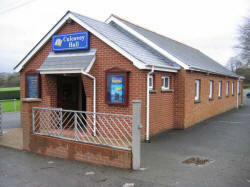 Previous to the erection of the first building known as “Culcavey Mission Hall” Gospel Meetings were held in an old school building belonging to the Hillsborough Linen Company as far back as 1919. Some time later a Sunday school was started in the Halftown Orange Hall and later a Gospel Meeting and Prayer Meeting followed. Those involved in this work were George McCord, Joseph Coulter and Robert Smith, and they decided that a permanent building was needed, so a wooden structure was brought from the brethren of Windsor Gospel Hall in Belfast. The trust deed then drew up showed Messrs. G. McCord, E. Woods, D. Patterson, S. Greer and J. Scandrett as trustees placing upon them no other obligation but that the building would be used only for evangelical meetings. The land deed showed that George McCord had transferred this plot of ground to the trustees free of charge. All these events took place around 1929. 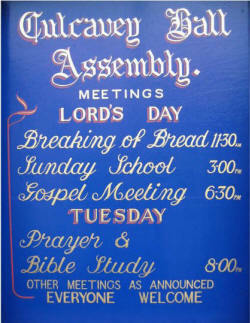 The Worship meeting or “Breaking of Bread” commenced in 1930. Much support was given by the Belfast’s Victoria Hall Assembly and by various other churches. Attendances were large, with missions being taken by Mr. Tocher of Belfast’s Templemore Hall and a Scotsman, Mr. James McKendrie. Most of the children in the village attended the Sunday school, where in the 1940’s the principal was Mr. Bobbie Smith and the teachers were the Patterson's, the Greer's, Mr. Porter and Mr. Thompson. Excellent Christmas parties were organised and an invitation was even extended to those who did not attend the Sunday school. By the mid 1950s the old wooden hall was beginning to show signs of decay, so it was given a front and a back of brick, leaving the timber hall in between. In the 1960s a donation of £500 was made by the Sir John Laing Fund to complete the building work commenced in the previous decade. A new hall was in effect built and linked with the brick front and back walls. During the building work, meetings were held in a tent loaned by a Mr. Glasgow of Newtownards. Further renovation work was carried out in the 1980s to provide what is now a very modern and fitting place in which to preach the word of God. The above history of the Culcavey Hall Assembly is taken from a book entitled “As it Was”. For a further look at “life in the 20th Century”, click on: AS IT WAS - A changing scene from Culcavey to Long Kesh, Co Down. Prior to the erection of the first building known as Culcavey Mission Hall gospel meetings were held in an old school building belonging to the Hillsborough Linen Company as far back as 1919. Some time later a Sunday school was started in the Halftown Orange Hall and later a gospel meeting and prayer meeting followed. A wooden hall was erected in 1930 but by the mid 1950s it was beginning to show signs of decay, so it was given a front and a back of brick, leaving the timber hall in between. In the 1960s a donation of £500 was made by the Sir John Laing Fund to complete the building work commenced in the previous decade. A new hall was in effect built and linked with the brick front and back walls. During the building work, meetings were held in a tent loaned by a Mr Glasgow of Newtownards. Further renovation work was carried out in the 1980s. In 1997 Mr John Beggs bequeathed his adjoining property, which provided a spacious car park. In 2006 work commenced on a new extension offering a minor hall, crèche, larger kitchen, storage and modern toilet facilities. It was completed in August 2008. Refurbishment of the main building in 2009 will include a new ceiling, platform improvements, up-graded of seating, modern lighting and audio-visual facilities including a loop system.